Jenny’s first recording of her solo career. She possesses a gorgeous feminine voice that has a huge amount of character and versatility that added to her unusual songwriting brings a lot of originality to her music. The album has a strong Canadian country feel that is so difficult to tie down, but is often recognizably different to that of the U.S, perhaps a little more flexible and experimental? Certainly there always seems to be a lack of uniformity and a great freshness that pervades much of the music and song structures. Everything has a wide open spacy feel, not just in the separation of instruments and vocals but in the feel of the music, perhaps going some way towards explaining that difference. and tempos, (although never above mid tempo) with every song having a strong, catchy melody. 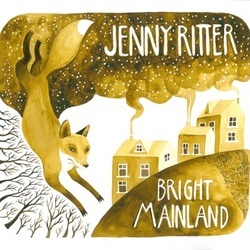 which again has just Jenny and this time a tuneful electric guitar on a chirpy sounding song that is full of optimism! Finally, the banjo makes another welcome appearance on the slow moodiness of One Three One, accompanied at times by the mournful sound of a cello and some excellent harmonies. vocals she is already head and shoulders above the pack. A tremendous album by a hugely talented lady!